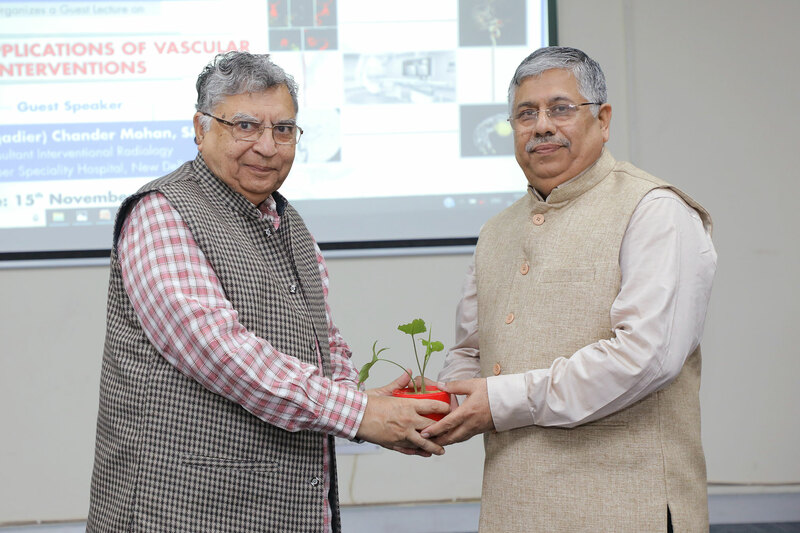 Department of Radio Imaging Technology under Faculty of Allied Sciences (FAHS) along with Faculty of Medicine and Health Sciences (FMHS) organized a guest lecture on November 15, 2018, on the topic “Clinical Applications of Vascular Interventions”. A very energetic speaker Dr (Brig) Chander Mohan, Director Interventional Radiology, BLK Super Specialty Hospital was invited for the guest lecture. The programme started with the lightening of the lamp by all the dignitaries present: Dr. T D Dogra (Director, IQAC), Dr. Sham Lal Singla (Pro-Chancellor), Dr. Kamlesh Kohli (Director, FMHS), Dr. V.K. Govila (Dean, FAHS), Dr. Sansar Chand Sharma (Dean, FMHS) & Dr. (Brig.) Chander Mohan & Dr. B.B Sharma (HOD Dept of Radiodiagnosis) Dr. Chander Mohan enlightened all the students and faculties with his great knowledge of Vascular Interventional Radiology.